Outage map updates electronically every two minutes. Detailed updates on current outages will come hourly during regular business hours and as we get information during non-business hours. Phones are updated less frequently. 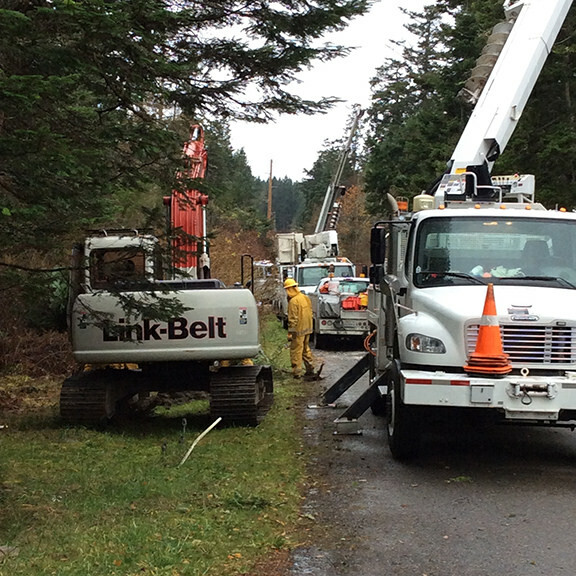 If you do not see your outage on the map, please call 360.376.3500 to report an outage in your area. Information on small outages may be limited especially after hours. Update: 9:45 Power fully restored. Wednesday, April 17th, 9:30 am to 11:30 am: Planned outage on SJI affecting 5 members on Victoria Dr. Crew will be replacing a transformer. Tuesday, April 16th, 2019, 9:00 am to 11:00 am: There will be an outage on Orcas Island affecting 3 members on Aviator DR and Piper PL, who have been contacted. This outage is for system upgrades and a new service hook up. Thursday, April 18th, 2019, 8:30 am to 3:30pm: There will be an outage on Orcas Island affecting 3 members at the intersection of Marguerite and Orcas Rd, who have been contacted. A new transformer site is being installed along with replacement of old cable with new. Track updates on Twitter @OrcasPower or #OPALCOoutages in long outage events. If you need non-emergency assistance outside of business hours, please contact Member Services, and we’ll respond as quickly as possible.